You've probably heard that you can't just use any old fridge outside. But, why not? What are the differences between indoor and outdoor refrigerators, and why is it important to know them? Here are three of the most important things to be aware of when looking for an outdoor refrigerator. There are two main differences between refrigerators designed to be used outdoors and indoors. First is ambient temperature range. Refrigerators have to work to keep everything inside it cold despite the temperature outside of it. We keep the temperature in our homes pretty even — generally between 60ºF and 80ºF. Outdoors, temperatures can change dramatically from morning to night, and vary widely from freezing cold to blazing hot. Outdoor refrigerators have to maintain consistently cold temperatures in that highly unstable environment. In the Summer heat, for example, a fridge would require additional insulation and more powerful compressors and components to keep everything cold. Second is weatherproofing for the electrical components. Even when built into a cabinet or other outdoor fixture, outdoor refrigerators can be exposed to water from rain, or from splashing in a pool area, or the like. Water and electricity is a dangerous mix, so special design precautions are taken to reduce the risk of electrocution. Be sure the fridge you buy is UL (Underwriters Laboratory) Approved for outdoor use. This weatherproofing is only to keep the electrical parts safe from water. It doesn't mean you can leave it completely unprotected in the worst of rainstorms, or function in the coldest of winters. 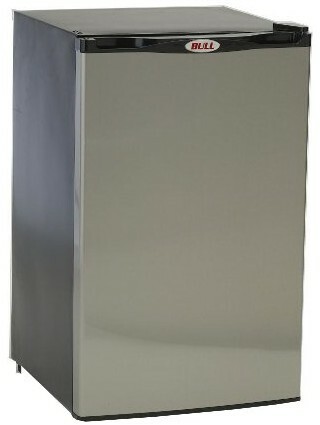 Almost all outdoor fridges are made from stainless steel thanks to its ability to resist rust in wet environments. However, stainless steel can still rust under the worst of conditions. And, not all stainless steel is made with the same level of rust-resistance. To avoid rust on your fridge, you'll want to buy one with a higher grade of stainless steel — which tends to be a little more expensive. Less expensive models will be made of a lower grade of stainless steel (which is more susceptible to rust), or of plastic-wrapped steel. You may also want to cover your fridge in particularly wet weather. Additionally, like their indoor counterparts, outdoor refrigerators are not designed to function in temperatures below 40 degrees. Why not? Because that's about the temperature the fridge tends to keep everything on the inside. If it's already cold enough outside the fridge, there's no need for it to turn on. Outdoor Refrigerator with front ventilation on the bottom. 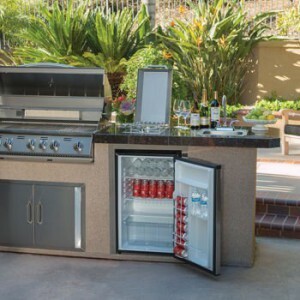 If you're going to build your refrigerator into an outdoor kitchen island, or cabinetry of some sort, be sure to get one that is designed to do so. Refrigerators need good ventilation to keep the components working properly, and to transfer the heat out of your fridge. “Built-in” classified refrigerators have vents in the front (usually on the bottom) so that you can build it in to the cabinet or island with a flush fit. Freestanding refrigerators need space for ventilation in the back, top, and sides. If you build it flush into a cabinet or kitchen island, you will inhibit its ability to function properly and keep everything cool. You can still install a freestanding model under a counter of some sort, but you must give it adequate spacing on all sides for ventilation. Outdoor refrigerators are a great convenience in the Summer and in warm climates. Be sure to understand the right features and capabilities to look for in a fridge, and to take good care of it, so that it will service you well for several years. Interesting stuff. I have been thinking of buying an outdoor fridge for a few years now. Is there any out there that you would recommend? I’m still working on a set of reviews so that I can recommend “3 Good Ones”, but in the meantime, I really like this one I reviewed from Bull. I was working for a stainless steel factory, and I cannot agree more with the line “Less expensive models will be made of a lower grade of stainless steel”. You get what you pay! Don’t be afraid to spend some $$$ more for a better product, you will not regret. Well, thank you for reading, Katie! I appreciate you reading and commenting. You’re right, in colder climates, an outdoor refrigerator might not be worth getting. But, if you’re ever thinking about keeping an extra refrigerator out in a garage for storage, for example, you might find this article interesting. 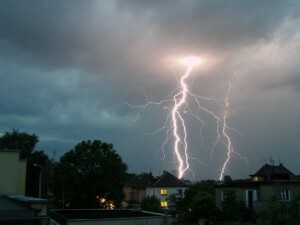 Where I lived, we have constant evening thunderstorms and flash floods are very common. I definitely have not seen an outdoor refrigerator here so this is a very interesting read for me. Wow, this is really informative, I never knew there were specific fridges for outdoor use! Excellent post containing plenty of useful details. Thanks for sharing your extensive knowledge! Anyway, as I live in the UK anything outside has to love the rain, wind and cold so the idea of outdoor refrigerators was completely new to me. Who knows, one day I may move to a climate where an outdoor refrigerator is a necessity. Thanks for checking in. I appreciate you reading despite not needing an outdoor fridge. But, hey, we learn new things and it opens our horizons! Hey Scott! Thanks for sharing all this knowledge about refrigerators. I did not know there were so many things to consider to buy the right refrigerator according to our needs. I can’t wait to have a big backyard where I can have a nice outdoor kitchen and grill, plus and outdoor refrigerator of course! Will keep this in mind! Well, I’ve never considered an outdoor refrigerator. I can see a use for an outdoor freezer for myself to store large quantities of meats and fish for example after buying wholesale. Security wise it’s not something that would spring to mind living in London, UK but I can see the convenience so thanks for the information. Yes, being from New York City myself, the concept was certainly new for me. Security and safety issues definitely come into play. You’d want a ridge with a lock on it to keep thieves and small children out of it. Storing bulk items is probably the most popular use for a garage refrigerator, which is slightly different. But if I were to buy one, an article like this would be of great help. Yes, I’m told it can get pretty cold where you live! People in your area might appreciate something more like a garage refrigerator for storing bulk items outside of the main fridge in the kitchen. Thanks, Anders. I appreciate you stopping by! “Outdoor does not mean all- weather”- good point Scott. I think it is one of the most usual mistakes about these great appliances. When it comes to drawbacks, higher power consumption is at the top of the list. Great article! Great info! I ‘ve always been curious how this would work. Great information. I live in Los Angeles and I’m currently building an outdoor bbq area and I’m going back and forth regarding the fridge and if I should go with an outdoor rated or indoor rated. There’s such a big price difference between them. But I was told to go with outdoor because the bbq area is a going to be custom built and it’s going to be built around my equipment. But I feel, “do I really need a outdoor rated fridge” I’M STUCK, DON’T LIKE THIS!!!! I hate to side with everyone else on this, but I agree that you should go with an outdoor rated model. I’m sure you’ve read the article about the technical reasons, but let me address your concerns about the cost. You’re building a custom BBQ area outdoors, which is a huge investment in time, money, and work. Now, imagine the additional cost and effort of replacing parts in that fridge (or that entire fridge) if some water happens to get into the wrong part of the fridge after a storm, or from a cooking spill on a vulnerable part of your cabinet. Will you be able to get into the fridge, or get it out of the fixture, easily for repairs or replacement? If it needs to be replaced, will the same model still be available, or one of the same dimensions? Will you be willing to pay the additional costs for that? And, I can assure you that the moment you install your indoor fridge outdoors, you will void the warranty, and can forget about getting help from the manufacturer. So, “Do you really NEED an outdoor rated fridge?” The question is really, “How much risk are you willing to take?” Think of it as an insurance policy of sorts. Sure, you can install a non-outdoor rated fridge, and you may never have any issues with it. But, you’ll need to be willing to pay more if the outdoor elements ruin your fridge. 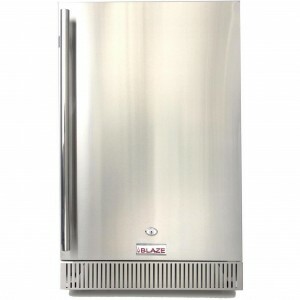 Additionally, there are a wide range of outdoor mini refrigerators for you to choose from. They can run anywhere from $300 to $4,000. So, look at the lower end, and see if any fit your needs. I’ll be publishing an article about budget-branded refrigerators soon. Keep an eye out for it! I hope this was helpful. Write back if you have more concerns. Thanks for reading and commenting!